For those of you interested in the mechanics of Chinese medicine, here is probably the best explanation of the Shu points out there. Its by Dr. Daniel Keown. The eve of Christmas eve, it is blowing a gale and thrashing rain, which just emphasizes the need to stay warm and dry. Damp, cold and wind invasion are often a threat this time of year, and there is a particularly nasty cold bug doing the rounds. Now is the time to visit your acupuncturist to stay on top of these potential threats. 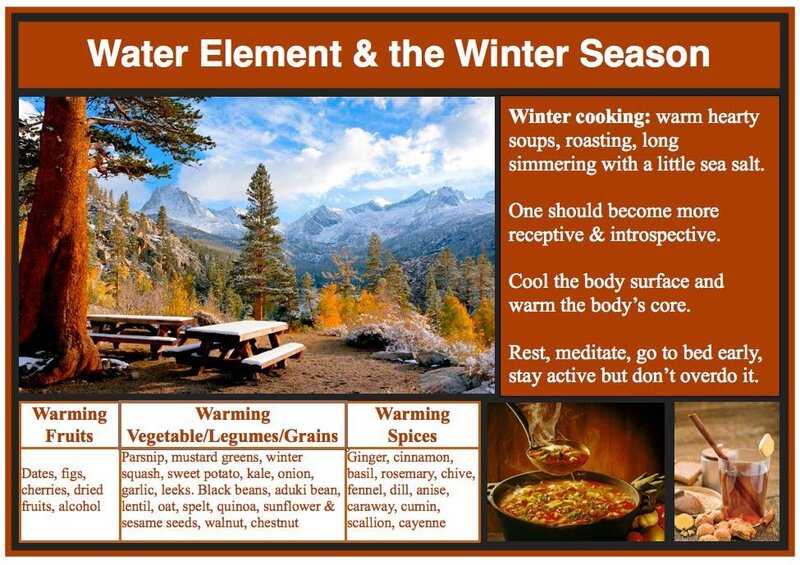 Below is a very good picture regarding good warming foods to include in your diet at this time of year. Thanks to AcuPro Academy. Once again, thanks to AcuPro Academy for this short video. ‘Tis Autumn, darker nights, cooler days, shorter days and longer nights. This is when the Yin rises and Yang wains. We should be gathering our resources for the winter and reflecting on what has gone before, a good summer, warm weather, substantial harvest. Looking at 5 element theory, autumn is a metal element season, and metal generates water. What!, metal generates water? Yes, just look at the car on these cooler mornings, covered in dew. (Metal generates water). Signs of imbalance to the changes afoot include diarrhea and constipation. These are signs that we are unable to let go and look forward, always thinking of the past and perhaps what might have been. We need to let go of our fruit and let it drop to the ground, rather than hanging on and this fruit is rotting and causing an imbalance. Remember, acupuncture can help restore this imbalance. June 20th 2016. The summer solstice, and it is raining. is there any wonder we feel so odd at the moment. Summer is the season of fire, yet we are being bombarded with water, (rain and damp days). Water insults fire in TCM (we use water to extinguish fire), therefore we need to support our fire element to redress this imbalance. Try to observe the dietary advice below, to help nurture the fire and combat the damp by moderating foods such as: milk products (except yogurt), sugar and sweets, white-wheat flour, refined starch and highly processed starch products, excess raw fruits (sugar) and vegetables (mold from the soil), excess mushrooms and fungi, peppers, cold beverages (which immobilize immune cells on the walls of digestive track), an excess of fermented foods, foods containing yeast and an excess of vinegar. And remember, acupuncture treatments can help restore the balance. Happy summer everyone. Spring has sprung, apparently, but has there really been a distinct change in season through Autumn, Winter and Spring? I have seen a number of people unable to remain ‘in balance’ as these changes have been so indistinct. Spring is the beginning of the season cycle, a time of birth and new beginnings. It is also the energy of the element Wood. This is the energy that brings forth new growth, that pushes the new grass through the snow, the new branches out from old wood, produces new leaves. It does this so nature can take in the nourishment it needs to flourish. Spring is also the time of hope; this season bursts forward with optimism, offering change after the quiet, still time of Winter. Each seed and sapling is following its own part of nature’s plan. Think of the wood of a tree, it gives nature structure and shape but does not let anything hold it back as it drives forward. Without this type of change all things would wither and die. Spring is the season of the Wood element. So what is this Wood element doing? It is moving forward, a direct assertive energy making no apologies for pushing things out of its way. As in nature the Wood energy is part of the energy of our body – the acupuncture meridians of the Liver and Gall Bladder. Given that each meridian has a job in the body s kingdom, the Gall Bladder meridian is “The Upright Official who Excels in Judgment” and the Liver is “The Official in Charge of Planning”. to have hope for our future. We are still in Winter, a water season. Let us have a look at the Kidneys, a water associated organ. Thanks to AcuProAcademy for the video. I know it is January, but there are people out there picking up injuries from all sorts of outside(and inside) sporting activities. Also, there are only 18 weeks until the Lincoln 10K. So what to do to ‘pinpoint’ the source of those aches and pains. Here is a short video from the British Acupuncture Council that may help. In TCM we consider the body to be in balance with the seasons, of which we recognise 5. Please watch this short video from AcuPro Academy for more information. At Old Court Acupuncture I offer treatments to address any unbalances arising from the changing seasons. New year, new you. here are 16 ways in which Acupuncture can improve your 2016. Thanks to Sara Calabro. Also, many people make resolutions to keep for the new year. Smoking cessation, weight loss to name but 2. Acupuncture can help to keep these resolutions. Call me for more details. Thats 01673 857412. Here we are well into Winter, the season of stillness, the element of water. Plenty of water around this year, and I wish everyone well who has been affected by the recent flooding. I have included some information around winter and water, courtesy of AcuPro academy. This weekend 7-8th November ‘The Fertility Show’ is on at Olympia in London. Acupuncture can help with fertility issues. here is a video of Clair Nasir explaining her experience of acupuncture assisting IVF. Here is a really interesting article as to how ‘Cupping’ works to remove ‘toxins’. Back pain makes up more than 50% of my workload, and we are currently in Back Care Awareness Week. Or is there a pain in your back? If so, you’re not alone. Millions of people in the UK suffer with back pain every day – from a constant dull ache, to sharp spasms that take your breath away. And it’s one of the biggest drains on the national economy in lost working days and cost to the NHS. One of the newest back pain treatments to reach the UK is also the oldest. Traditional acupuncture has been used in the far East to treat back pain for thousands of years. Now people in the UK are turning to acupuncture for relief – with good reason. Back pain is one of the most well researched health conditions that acupuncture can treat. The results are so impressive that it’s recommended by the NHS for chronic lower back pain. Research shows that the best results come from the full system of acupuncture, which is practiced by traditional acupuncturists. The back pain is relieved by affecting how qi flows to bring your whole body back into balance. The year in TCM is divided into 5 seasons, Winter, spring, summer, Late Summer and Autumn. Each has its own elemental characteristic, and can have profound effects upon the body. We are now leaving Late Summer and entering Autumn (in the West), that is the summer equinox is upon us. Metal is the element of Autumn, and the organs are Lung and Large Intestine. Below is a short video about the Lung organ, produced by AcuPro Academy. 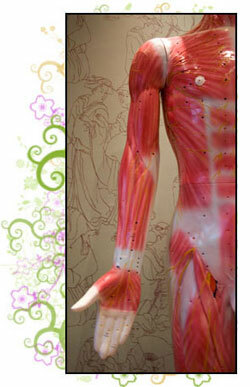 In the last few months Peter has completed a KINESIOLOGY TAPING course. The use of Kinesiology tape is becoming more popular and sports men and women such as David Beckham, Serena Williams, Mario Balotelli, and many of the 2012 Olympic Athletes have been seen wearing it. Kinesiology taping was developed by Kenzo Kase, a Japanese Chiropractor and Acupuncturist, in 1979. He felt that traditional taping techniques were to restrictive, whereas Kinesiology tape allows the joints and muscles to move, and stimulates the movement of Lymph fluid. Kinesiology tape can be used for joint injuries, muscle injuries, as well as headaches, plantar fasciitis and the reduction of Lymphoedema. Anecdotal evidence seems to show that there are benefits, but RCT’s have yet to be completed. Follow this link to find a good article from the Guardian Newspaper.